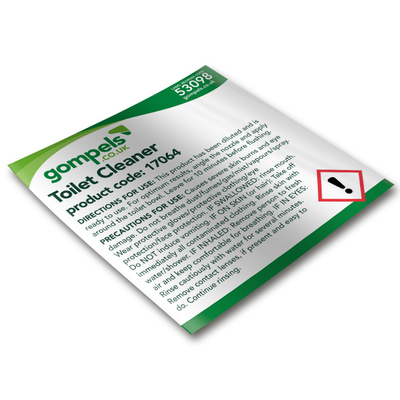 Designed to support your cleaning force, these Labels for Gompels Concentrated Toilet Cleaner are a handy and practical addition. Allowing you to distribute out larger containers into 500ml bottles, each of these labels has been pre-loaded with the correct information for their specific product. This includes everything from load suggestions, concentration amounts and special care advice that could become imperative when utilising the specific liquid. They also contain accurate directions for use and have a self-adhesive backing allowing them to be affixed directly to our corresponding 500ml bottles. Coming as a pack of 6, they help to prevent the use of incorrect chemicals on different surfaces or in different environments while helping ensure your strict cleaning routine is kept at the highest standard. Sized appropriately for corresponding 500ml bottles. These labels correspond with our Gompels Concentrated Toilet Cleaner 2.5 Litre. They can be used alongside with our 500ml Bottle and Nozzle for Toilet Cleaner or Washing Up Liquid, available online here at exceptional wholesale prices.